Charles and Ray Eames believed "design is a method of action," and they continually updated their work as new materials became available. "The chair that Charles and Ray were designing," explains grandson Eames Demetrios, "is the chair that’s made tomorrow." The duo originally designed their molded chair in metal and entered it as a prototype in MoMA’s 1948 International Competition for Low-Cost Furniture Design, then refashioned it in light yet strong fiberglass just two years later. In the 1980s, after determining fiberglass production was detrimental to the environment, Herman Miller ceased production to explore more sustainable options, eventually choosing recyclable polypropylene. The company never quite forgot about fiberglass, however, and it recently began researching greener production methods. The Eames Molded Fiberglass Chair (1950) is the end result, constructed using a cleaner process but true to the original with its beloved variegated surface. This reintroduced version comes in a range of reformulated semi-gloss color pigments that faithfully reproduce the vintage ones. Its deep seat pocket and waterfall edge keep you comfortable by reducing pressure on the backs of your thighs. The seat back is left unfinished to maintain a slightly rough natural texture for easier gripping with your hands. 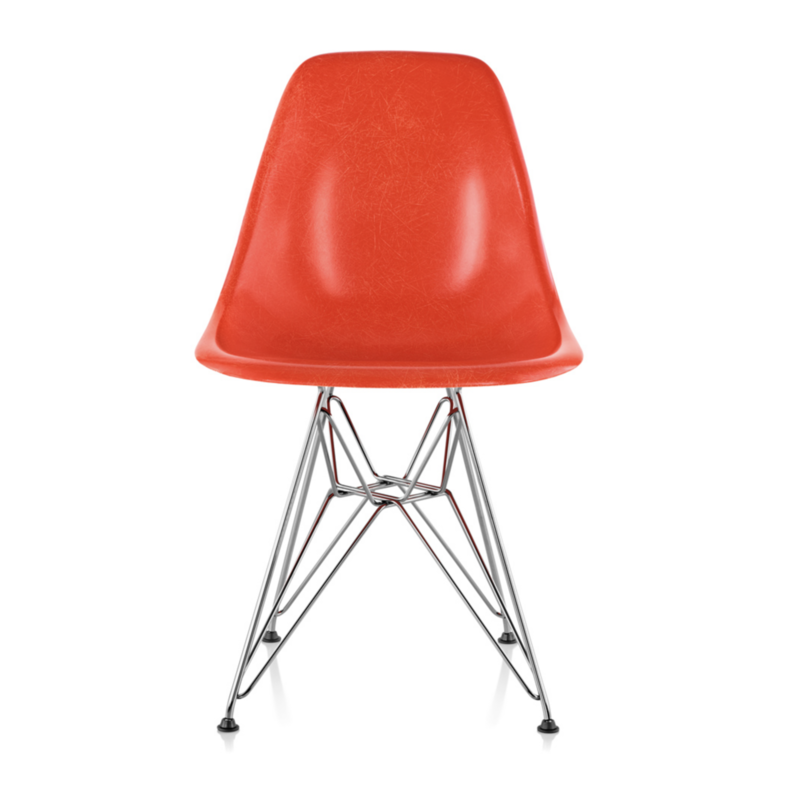 This is an authentic Eames product by Herman Miller. Made in U.S.A.